Founder of Polish Female family nr 5. Milordka was a grey, foaled in 1816 at Slawuta. Dr Skorkowski writes of accepting the strains of Milordka and Woloszka as Saklawi strains, because they showed the features of the Saklawi race to the highest degree. Or anything else about tail female line in general. As per my pm I'm wondering if you would have a look at the pedigrees of my two Arabs? I'm interested in the characteristics (physical and non physical) that are passed on through the bloodlines and if my two are typical of their breeding. I have managed to pick up a few nuggets of information from this thread so far so hopefully the guesses I've made are correct. The first one is http://www.allbreedpedigree.com/kamar+al+karif. He is 14.3hds and has a tail female line linking back to Rodania via Rose of Sharon and I understand him to be a Keheilet Rodanieh. He is one of five, I think, and his brothers and sisters have all done well in hand and under saddle. They also vary in colour being grey and chestnut. Kamar loves to be centre of attention and does sulk if he is not given the attention he feels he deserves. He is quite expressive with his facial expressions. I swear sometimes it is like he is trying to talk to you in English and he appears to understand everything you say to him even if he chooses to ignore it. He also has enough snort and blow for the in hand ring. Could this be partly to do with the crosses to Rodania I wonder? My second Arab is http://www.allbreedpedigree.com/al+haj. He is larger being 15.1hds and has larger features such as his ears and larger head, shaped differently to Kamar (Ali's head shot is 5th from left on my sig pics). He links back to a tail female line of Ghazieh - according to allbreed. I am not sure what strain this makes him or the physical characteristics of his strain. His disposition at home is excellent, so laid back and chilled out. Could this be from the dam line Bint Helwa? I understand he has only one full brother that is slightly larger than him and he is grey and also has the same chilled outlook on life being very kind and gentle. Ali has thicker mane and tail hair in comparison to Kamar with a wave in it whereas Kamar's hair is straight. Ali's tail is also held very high most of the time - could almost be accused of gingering him. Having seen him under saddle he reminds me of a park horse in the way that he is very upright, ears forward and tail very high with lots power, however without the high knee action. Ali is a stallion and I am wondering what would be a good cross for him although my motive for buying him was not to breed from. If I did decide to breed from him it makes me curious what you think he may pass on to his offspring and what I should look out for in a mare? I would probably want to look for a mating that was shorter in height and had a slightly more dished head. Ali's sire's full brother, Khaneesah, has also been noted for his kind temperament and so it will be interesting to see if you think this would theoretically be passed on being from the sires side. Any information you have would be most welcome and appreciated. Hope don't mind me asking i'm thinking of put my mare Shah hannah with Cumbria kaiser,both have sweet temp and more % egyptian,would they both give me a stunning foal with pretty dish face like shah hannah? Well, having never seen Cumbria Kaiser, would hope he is dominant for a pretty head and over all great conformation. Have you seen any of his foals? How are the legs? Heads? Overall balance? The blood suggests that pretty is definitely in the pedigree but when color is bred for alone...often the rules of great conformation, type, etc. are forgotten to achieve Black. So if you are satisfied that all the rules of conformation, type and temperament are met, you should have something lovely. But for color, they look almost as if they are outcrosses for each other. It may make for a wonderful pairing! I am looking for a bit of guidance regarding my filly and her potential hubby. Her name is Panndora (vodafon kossack x hs pelagrina)She is very sweet but can be hot at times.Her conformation is good,good limbs,body and topline.The only thing I would say that could do with improving is the head and eye.She is quite a big winner so she isnt that bad!I have been thinking along the lines of Egyptian? if I could find one with a good head.Any suggestions welcomed. When running her pedigree, it looks like two things...She is 1) a 3 year old with 2) heavy Polish blood through both sire and dam...You have to remember that the Polish lines tend to be rather plain to unattractive as 3 year olds and then bloom into absolutely spectacularly gorgeous 4-7 year olds. For some reason nothing looks quite right until they get over that 3 year old hump. Your girl is royally bred and can only imagine that as she matures she will steadily improve and by the time she is 7-knock everyone's socks off. She is bred to be a major beauty in her own right...Now if she didn't have a good start-the dam was improperly fed/nurtured while Panndora was gestating or she was fed badly as a youngster-she might not live up to her pedigree. So, take a look at the list of stallions above, noted in the post to Moatside, particularly SG Latif Ibn Liana (he has a spectacular head and eye as does Charismma and several others) and you should have something rather notable to think about or look forward to! Just as an aside...the most beautiful eyes seem to always come in via the Spanish bloodlines...Conversely heads are a matter of taste. Have sent you a PM but think both boys are out of this world-the word 'jaw-dropping' comes to mind, and the farms and their owners are just fabulous! Think that is one of the extra special treats of the UK farms....fabulous horses, eat off the floor facilities and super owners! Pure magic! Thank You!I am very happy with how she is maturing - easy to do and genuine. An immpressive list of names - SG Latif Ibn Liana and Arastin are two that I had not seen- both are beautiful. Lots to think about and lots of nice boys to see! Oh Kim, Well done and congratulations! That is quite an accomplishment first time out. Pearl looks wonderful. What I'd like to do is suggest a group of names to you and if you can, go see all the horses and the one that makes your heart sing loudest is the one you want to send her to. Am very pleased to read that you plan to keep the foal, too. Espinho, WH Justice, WSA Charismma, Aarazi, Camargue Too, Arastin (or anything at Cullinghurst), H Tobago, Deriwtiv Gwyddion and there is a colt at Susan George's that I think is absolutely fabulous and out of Ali Khamsin/Ali Khamoud's dam: SG Latif Ibn Liana by Kz Ibreez x Liana El Shaklan. I saw him as a very beautiful if not exotic, ultra sweet, loving youngster and he blew me out of the water as did both sire and dam. The wonderful aspect to your girl's pedigree is you could probably breed her to a Missouri Mule and have a splendid result. Thank you for the photos, Kim, and please, keep us posted! You did a great job! And what a fascinating pedigree! Very imaginative breeding...The sire O-Tejo is to Rabdan via the wonderful Anter, a gorgeous stallion known for his sweetness and loyalty...O-Tejo is a 3/4 straight Egyptian + Crabbet with the dam line tracing to the Blunts', Rodania, a Keheilan Ajuz of the Ibn Rodan-the single most successful dam line ever! Your Christmas present should prove to be a great riding mare, loving, loyal and a terrific broodmare should you choose to breed her. Have any pictures? Would expect she is very pretty with a lot going for her so you might want to think in terms of showing her as well! In any event what a wonderful Christmas present! 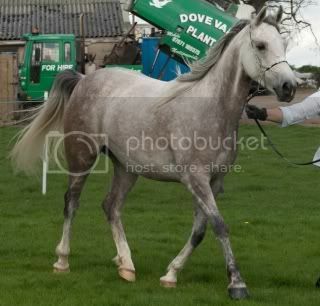 We went out to a local show last weekend (1st time out) and she won the Anglo/Arab/PB and was Res Champ in-hand. If I was to consider putting her in foal next year who would you recommend? The foal would be a keeper and a one off so I want to get it as right as I can!! Yes, your mare is pure in the strain Rodania but she has a very interesting pedigree. Half the strains are not Rodania when counting from the 5th generation...What is more compelling is that when one runs the pedigree one more generation, guess what? Rissalix is featured 7 times within 6 generations and the strength of this line comes from who? Azrek and Azrek - renowned for great motion but who also carried many traits along with that superb motion and Azrek was a Seglawi! So when you say she doesn't look like a Rodania...Am not surprised. Besides her sweet temperament, and being a superb riding horse my guess is that she extraordinarily intelligent to the point you suspect that she sometimes is reading your mind and then wondering if you are losing yours, "no creature could be that smart!" Trust me she is! What I'd like to see you do, since you do have such a superb individual...is pick out three stallions that make YOUR heart sing....and then lets analyze those pedigrees. If possible, try to pick non Rodania stallions...(If you were to put a gun to my head...for her pedigree, I'd probably suggest three stallions: Akhira in Scotland, Carmargue Too in Yorkshire, and either Tobago or Dervatiw Gwyddion tracing to the Harris import, Nufoud, said to be a Kuhailan Ajuz bred in Saudi Arabia. I have an old mare , pure English, a rodania who does not look rodania type. She is dark chesnut , high withers, long fine hair, fab topline and excellent tail carriage ,good length of neck and good legs and feet. Moves like dream. Her head is nice but not beautiful. Large but sharp ,inturned ears and a very slight dish which is disguised by an unusual blaze. She has a sweet temperament. Do you believe in staying in the female tail strain ? Beyond a shadow of a doubt...you have an extraordinary mare whose character will be passed on to all her offspring. The general rule is: size and shape comes from the stallion...all else from the mare...(i.e., you should have little over which to be concerned...) Can't wait to see those photos! Hi Egbert - -thank you for your thoughts - very interesting. Photos are sparse yet (I only have a couple of her showing as a youngster) but as soon as the coat is out I will post one. She is a very special mare who is incredibly intuitive, loving, willing with a temperament to die, so I hope that carrys through in any offspring. If money is no object there are several that I would love to see cover your girl....You have, of course, a heavy Kuhailan mare despite the fact that 'dad' is pure in the strain Hamdani Simri...First choice would be WH Justice as he is a Seglawi and any issues he has will be corrected by your girl. I love his look and so far all the babies I've seen that he has sired. Emilusz-another fabulous Seglawi sired some breathtaking offspring for Jorgen and Britt Olsen's Oppreva Araber in Sweden. There are pictures on their website of babies to die for. He is very impressive. Then any of our favorite *Carmargues in the UK but first choice would be like Charismma, Ali Khamsin, Camargue Too. Espinho has to be spectacular but his dam line is to Estopa....so suspect you would have a pure in the strain Kuhailan Dajania. You've a fabulously bred young lady there...would love to see pictures when you have a chance! I wonder if I can ask you a question re my mare I hope to put in foal in due course she is Palubnik X Queens Topaz (I am sure you know the breeding well!) 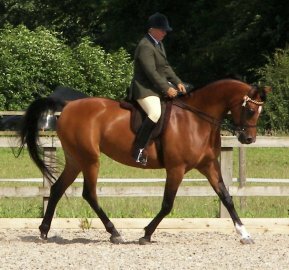 however I wont be able to use my own stallion Plumbum (Balaton x Pantomima) for obvious reasons. What do you think would work well? I would be interested in your thoughts. It wont be for a couple of years as she has a ridden career first! Thanks again Gari, I have also passed this information on to kate to cheer her up, shes feeling pretty rough at the minute. Well, Spirit, Charismma, Maximus, Carmargue Too would be fun...WH Justice, FS Bengali, Magnum Gold would be great fun....and there are sons in the UK, too! But again, think Tobago will add to the tremendous power, pretty and 'look at me' attitude...This mare isn't afraid of anything...She will think about things before she makes a decision about what to do and if you ask her she will come through for you....The old war mare lines that we know of-were simply incredibly courageous, intelligent and athletic...You have all that...Tobago is the frosting! Hi Gari, thanks for you reply, its very interesting. How amazing that she is related to war horses. It was very hard to choose a stallion for my mare as there a so many wonderful stallions out there with so much quality. But I just love this boy and Tobago is really stamping his foals. I would love a filly as I would be keeping it to show in halter classes, then ridden, then join the breeding program. What do you think Tobago will add to her, obviously the idea is to improve on your mare when you are breeding. This mare is so close to my heart that I couldn't wait any longer to breed from her as I needed to know I would be left with her legacy one day. It will be so much fun choosing stallions for her in the future. I do hope you are right about the powerhouse bit. I know Lynda (her breeder) always said she was given her name 'Ballerina' as she floated round the field like a dancer. Minette's foals have been known to all be very proud of themselves and true matriarch mares, this is definitely the case where Ballerina is concerned, she loves an audience and always looks like she should be parading a foal at her side. Can you recommend any other stallions that would be suitable choices for the future, I had thought of AV Montoya as it would be a double Sasaki foal, and also I love LVA Maximus's Spanish lines. All these lucky people with wonderful stallions. Thank you Gari. Here are hopefully some pictures of bally. Im pretty useless as this picture business. click on the link to pictures if they dont work. she was top quality since the day she was born, she stayed with me until she was 5 years old, and although she was bred for ridden, she did give me a beautiful filly from WSA Charismma. My question is... we have three boys at home ...and i was wondering which one you feel would be the best cross with her, i do have a good idea but its nice to know what you would think! If i was wanting to improve on this filly it would be her legs(not that they are bad) just that its one thing i would like to improve, I'm always very critical of my own horses! Also i don't have to use any of my boys i could send her to another stallion ...so any ideas of good crosses would be greatly appreciated! The boys! Sorry i did try to link it to there pages on all pedigrees but it just wont for some reason! Would love to see a picture of her if at all possible. She must be so lovely. Also your boys are wonderfully bred! Would like to see pictures of them as well! Spirit! Well, the sire line will be Nazeer the dam line Rodania and a lot of Kuhailan in between...So this cross will be a powerhouse....Very showy is the first thing that emerges, stout yet refined, brilliant moving, first and foremost a show horse. Also if memory serves me well the mare Mifaria was supposed to be very beautiful in the flesh (the photo in All Breeds not doing her justice). All in all, think you will have a powerhouse cross. 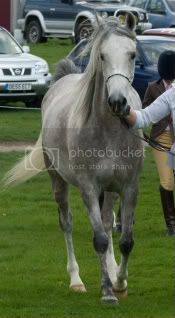 Ballerina's dam, Minuette was a very successful show mare by the gorgeous, royally bred Silver Scenario and out of the Silver Sheen granddaughter, Mishna...All in all, Ballerina has to be great mare and wonderful broodmare. Hi Gari, I asked for your opinion last year on one of mares breeding, She is by Arastin (Simeon Sadik/Arina) out of Monosterra (Monitor/Zaneta)and she is due in may to Om EL Bahreyn (CG Balih El Jamaal/Om EL Benedict), I've got a month to wait and I'm hoping it will be as lovely as you expected! 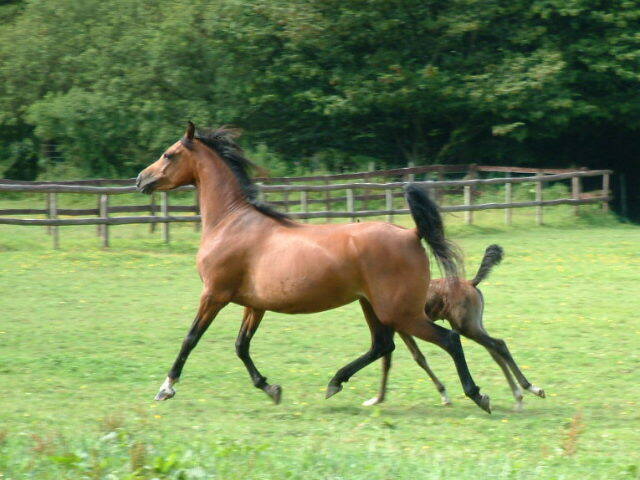 I promise some pictures of mare and foal when it arrives as you asked last year. On another note, one of my other mares is going to be inseminated next month and I would like to know what you think of the potential cross. As does the stallion owner, Kate, who is also very excited about it. It would also be wonderful to hear a little about her breeding as well if possible. At some point in time I am going to have a *Rushan/*Carmargue stallion that will be out of this world...but until that time comes...Yup! Think a *Carmargue, sire line Naziri will be a wunderkind for you...But go meet some of the Carmargues...Look a the dams, like that of Charismma's, Bint Shantu Halima-a fabulous mare of extraordinary quality. Looking at your mare's dam line, I do feel strongly that you would do well with either a Seglawi or Menaghy dam line to capture the quality and enhance what you already have. Now just as an aside and a real need to BRAG...*Rushan's son Diamond Ruler L, aka Rebel, out of an old Draper line mare (old respected breeder on the West Coast of the US) was on a 30 mile endurance ride when one of the riders became ill and had to be helicoptered out. Reb had never seen a helicopter before but only leaped over a piece of sage brush and otherwise maintained his composure! This is a 4 year old out on his first major ride! His owner is thrilled beyond words that he did so well! Me, too!